Successfully Added Folding Headphones MP3 Player - SD Card, LCD Screen, FM Radio, Rechargeable Battery to your Shopping Cart. Listen to your favorite tracks in comfort with a pair of rechargeable headphones that also come with a built-in MP3 player SD card input and FM Radio. Don’t let yourself get bored on the road or in a waiting line and make full use of every free minute — this will be really easy too with these folding rechargeable headphones with a mini LCD screen. With soft padding, the lightweight headphones are exceptionally comfortable to wear. The mini LCD screen will give you information about the track that is playing and you can upload lots of favorite tunes to play via an SD card. 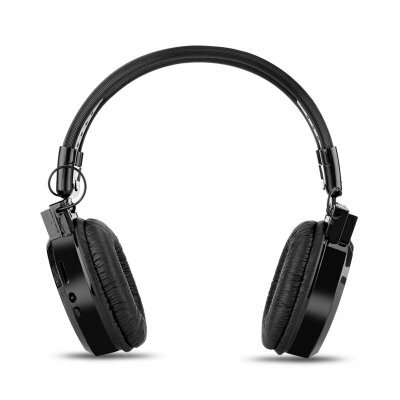 This way, these rechargeable headphones are pretty much an independent MP3 player. With 8GB supported on the card, you will have plenty of storage space for thousands of tracks letting you take all your music, educational programs, language courses, E-books wherever you go. The rechargeable 300mAh battery offers up to 8 hours of non-stop music play. So, you will have plenty of time to enjoy your music. The headphones also come with a built-in FM radio — so, even if you’ve forgotten to stock up on cool tunes, you will always be able to listen to an array of FM radio stations. With a 3.5mm audio input jack you can easily use the lead supplied and connect these headphones to your tablet, smartphone or other music player. The Folding Headphones with MP3 Player comes with a 12 months warranty, brought to you by the leader in electronic devices as well as wholesale rechargeable headphones..